A-HOTEL.com - Luxury and cheap accommodation in Dubovoe, Russia. Prices and hotel, apartment booking in Dubovoe and surrounding. This indicative offer was derived from the most recently booked accommodation in Dubovoe and sort by the price, from cheapest Dubovoe accommodation to the most expensive hotels. To select accommodation by your preferences we recommend to choose from 3 accommodation offers in Dubovoe in total. By entering the dates of your overnight stay in Dubovoe and using the filter tools you can sort the best possible accommodation for you. The entered dates of your stay are crucial for the most accurate offer as it derives all the online information on pricing and availability of Dubovoe accommodation. Then you can book the selected Dubovoe lodging (hotels, apartments etc.) immediately. VIP Номер provides accommodation with a kitchen, situated in Dubovoe. Complimentary WiFi is offered. Situated in Dubovoe in the Belgorod region, Apartment ULITKA has a balcony. Guests staying at this apartment have access to a fully equipped kitchen. Fazenda Country House is set in Dubovoe and offers a shared lounge and a bar. The country house is in an area where guests can engage in activities such as hiking and darts. VIP Apartment offers accommodation in Belgorod, 6 km from Belgorod State Regional History Museum and 6 km from Marfo-Mariinsky Convent. The property is 6 km from Belgorod State Fine Arts Museum and 6 km from Belgorod State Drama Theatre. Located in Belgorod, отель ЕСЕНИН features accommodation within 6 km of Belgorod State Regional History Museum. Complimentary WiFi is provided. отель ЕСЕНИН in Belgorod offers accommodation with free WiFi, 6 km from Belgorod State Regional History Museum. The property is 6 km from Marfo-Mariinsky Convent. Located in Belgorod, Apartment na Esenina 24 provides accommodation with a seating area and a kitchen. Free WiFi is featured. Set in Belgorod, 6 km from Belgorod State Regional History Museum, 6 km from Marfo-Mariinsky Convent and 6 km from Belgorod State Fine Arts Museum, Apartments on Budennogo 17v features accommodation with a balcony and free WiFi. Guests staying at this apartment have access to a fully equipped kitchen. Located 6 km from Belgorod State Regional History Museum and 6 km from Marfo-Mariinsky Convent in Belgorod, Апартаменты на Бульваре Юности offers accommodation with a kitchen. 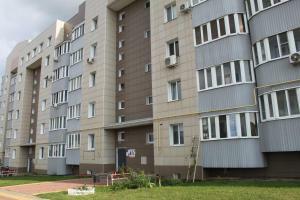 This apartment is 6 km from Belgorod State Fine Arts Museum. Situated in Belgorod, 6 km from Belgorod State Regional History Museum and 6 km from Marfo-Mariinsky Convent, Apartment on Bul'var Yunosti 21/1 offers free WiFi and air conditioning. Guests staying at this apartment have access to a fully equipped kitchen. Apartment on Gubkina 17 offers accommodation in Belgorod, 5 km from Belgorod State Regional History Museum and 5 km from Marfo-Mariinsky Convent. The accommodation features free WiFi.